Arthroscopic decompression of the shoulder is an arthroscopic shoulder procedure that Dr. Meier uses to treat shoulder impingement syndrome when patients have failed to respond well to non-surgical techniques alone. Prior to any surgical procedure, Dr. Meier recommends conservative treatment options and regenerative medicine techniques in order to achieve the best possible results. To find out if an arthroscopic shoulder decompression would help your condition, contact Beverly Hills orthopedic surgeon Steven W. Meier, M.D., of Meier Orthopedic Sports and Regenerative Medicine, at 310.736.2793. You can also fill out the contact form and a representative from our office will be in touch with you before long. Shoulder impingement syndrome can include a combination of bursitis, inflammation, fraying or tearing of the rotator cuff, and bone spur formation in the shoulder. Shoulder impingement syndrome causes pain and limits range of motion in the shoulder joint. Its symptoms can include discomfort and acute shoulder pain when raising your arm over your head, reaching into your back pocket, or after sleeping on your shoulder. People who work and use repetitive overhead motion are at a high risk of developing shoulder impingement syndrome. To diagnose shoulder impingement syndrome, Dr. Meier will perform a physical examination, thoroughly review a patient’s medical history, and take an X-ray. These things help to plan out a course of treatment designed to correct the pain and lack of mobility resulting from shoulder impingement. ncbi.nlm.nih.gov has more information on shoulder impingement syndrome. Before Dr. Meier recommends arthroscopic shoulder decompression, he may recommend some conservative treatments first. 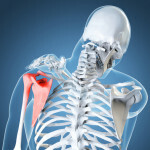 Some non-surgical treatment options for shoulder impingement syndrome include physical therapy, activity modification, and anti-inflammatory medication or regenerative medicine injections, such as stem cell or platelet-rich plasma therapy, or prolotherapy treatment. For some patients, that these treatments do not succeed, or may not work given the severity of the damage to the shoulder, and arthroscopic shoulder decompression surgery may be recommended. 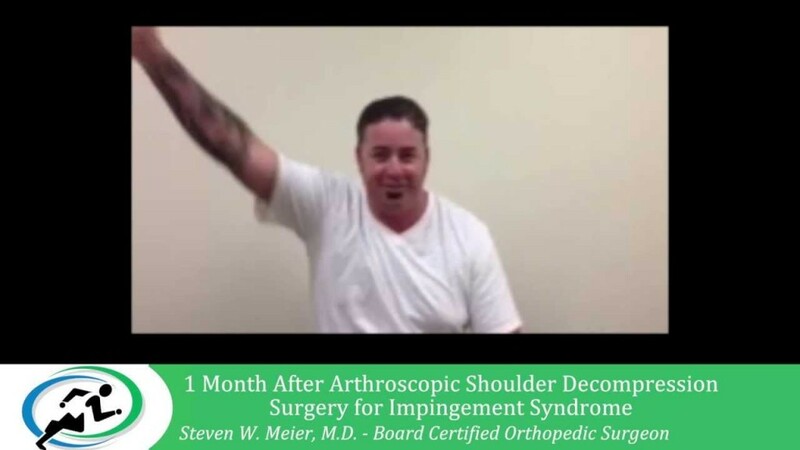 The surgery to help improve shoulder impingement syndrome may be performed arthroscopically or open, but Dr. Meier prefers an arthroscopic approach to subacromial decompression. The benefits of arthroscopic shoulder decompression surgery (over “traditional” open surgery) may be shorter recovery times and less pain in the days immediately following surgery. Arthroscopic surgery is a minimally-invasive approach to surgical procedures. Arthroscopy is performed to both evaluate and treat orthopedic conditions. In certain cases, where conservative treatment has failed and diagnostic imaging is inconclusive, and the patient is still experiencing pain and loss of function, Dr. Meier may use the procedure to gauge just how significant the damage in the shoulder joint is, and then, while he is in there, he will repair any damage he can in order to achieve the best possible surgical result for the patient. Arthroscopic subacromial decompression starts with at least two small incisions to allow the specialized equipment access to the shoulder joint. An arthroscope, a surgical instrument with a light and camera displays images from inside the shoulder upon a video monitor in the operating room. The arthroscope is surgically inserted into the shoulder joint in order to visually evaluate any damage. Dr. Meier will thoroughly inspect the shoulder joint, looking for tears in ligaments, muscles, and tendons so that an overall assessment of the joint surface and associated structures are made. Some injuries, which may not be evident on an MRI scan, or even with open surgery, can be discovered thanks to the innovative nature of the arthroscopic surgery. Once the joint is examined, the arthroscope is then placed into the space above the rotator cuff and other instruments are inserted into the other incisions so that Dr. Meier can smooth away any bone spurs that are causing inflammation and impingement on the shoulder’s rotator cuff tendons. The risks associated with this surgery are similar to that of other types of extremity surgery. A good orthopedic surgeon will caution you to be wary of infection, wound healing problems, and bleeding as well as injury to nerves, blood vessels and the joint surface of the shoulder. A small percentage of patients, if they are not diligent with their physical therapy rehabilitation, might develop a significant stiffness after the operation, which is referred to as “frozen shoulder.” However, the vast majority of patients will experience none of these complications after arthroscopic decompression of the shoulder. After surgery, our immediate concern is that you are comfortable and can manage the shoulder pain. Prescription painkillers might be prescribed, and your arm will be placed in a sling when you go home after arthroscopic shoulder decompression surgery. After a week, you probably won’t need the painkillers anymore. Most patients begin to resume light activities after a few days. Once the stitches come out, we will begin you with physical therapy aimed at regaining range of motion without pain. More strenuous exercise will begin a few weeks after surgery, once you have regained full range of motion with minimal pain. Your doctor or a physical therapist will outline a detailed physical therapy program for you. Most patients will return to work and most of their daily activities anywhere from a week to three months following arthroscopic shoulder decompression. A full recovery can be achieved anywhere from three to six months, but some people will require more time. It all depends on the severity of your individual case and the extent of the shoulder impingement syndrome, as well as your commitment to physical therapy rehabilitation after the surgical procedure is over. Steven W. Meier, M.D. is known as a leading surgeon within his specialty for orthopedic services and sports medicine, and patients with difficult and complex joint disorders often seek him out for a second opinion or for revisional surgery. As a result, patients sometimes travel from out-of-state and even overseas to receive his medical care. Dr. Meier has refined how to individualize and streamline medicine to meet the demands of high-performance individuals and provides the same level of progressive treatment to athletes and non-athletes alike. To schedule a consultation with an experienced Beverly Hills orthopedic surgeon, contact Dr. Meier today at 310.736.2793 or fill out the contact form and a representative from Meier Orthopedic Sports and Regenerative Medicine will be in touch with you shortly.